This LP (long playing) is not available anymore. It has become a valuable collectors item! 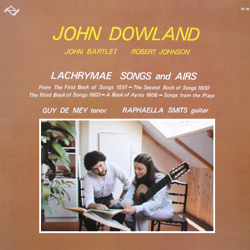 The English composer John Dowland had in his work a distinctive blend of poem, melody and harmony that remains unssurpassed. Aged 17-18 he spend two years in France and discovered there the 'voix de ville', the model for his own ayres combined with an English lyricism. John Bartlett was a 16th-17th century lutenist and composer. Nothing is known of Bartlett's personal history, except that he was probably a household musician to Lord Hertford. Robert Johnson was one of King James I's lutenists. 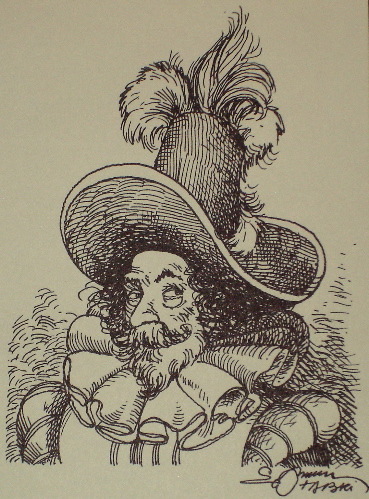 He was favoured as a composer of instrumental music but he was also frequently employed to provide vocal music for the productions of the "King's Men", the foremost company of players in London (Songs from the Plays). "My sincere congratulations for this splendid recording of Dowland's magnificent music ; likewise with respect to the soli for guitar." "This recording, I declare hand on heart, is exceptional, and on the Belgian market it's unique! Raphaella's accompaniments are delicate and interwoven with melancholy. A recording without bombastic sentiment but with unspoken yearning."